Compiled from divers' votes, here is the definitive list of the best dive sites on the planet. How many of them have you dived? The list is overwhelmingly dominated by warm water dives, with the only cold water representatives coming from the Galapagos, Iceland and, perhaps surprisingly, the Isle of Man. 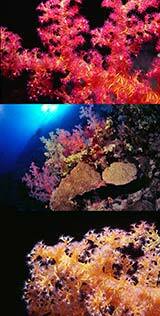 Vote for your favourite dive sites below. You may also be interested in the Best Wreck Dives list and the Top Dives in Europe. From the sardine run to swimming pigs - a diver's wish-list for finding the very best underwater wildlife experiences. The first criteria is number of votes (weighted to favour the first choice dive site above the second). Where two dives tie for a position, priority is given to those with the most enticing descriptions and those whose area has several votes for different dives. Every month we send out a free newsletter featuring the best diving areas, underwater life, diving book reviews and interviews with authors. To receive this please fill in your e-mail address below. For an archive of previous issues see the SCUBA News page.